Posted in: Damien Burke Driving Test Passes, Driving Lesson Frome, Driving Lesson Radstock, Driving Lesson Trowbridge, Driving Lesson Warminster, Driving Lesson Westbury, Happy Customers. A brilliant result for Emily Cooke of Frome, Somerset who passed her driving test FIRST TIME with only a few faults in Trowbridge. 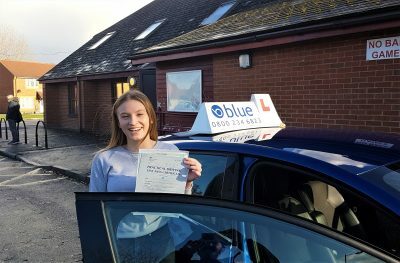 Emily had to drive though a lot of narrow suburban streets lined with parked cars and then headed out to Bradford on Avon for her independent driving test route. 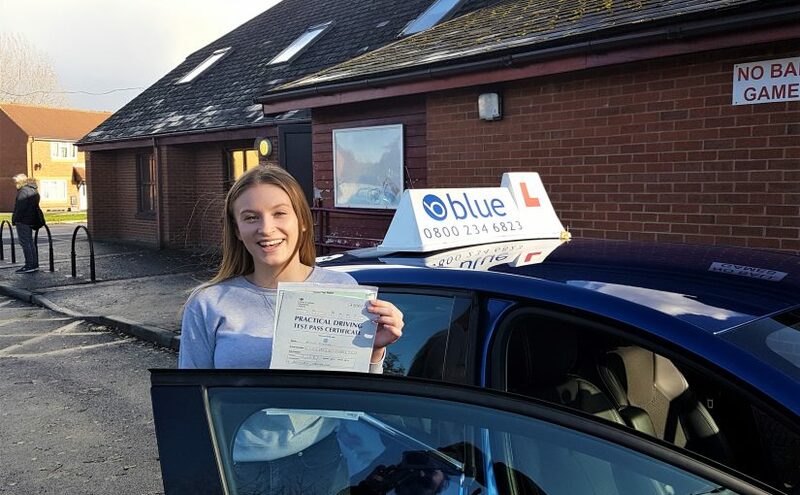 Emily had to do a reverse on the right.. All the best from Damien Burke you’re driving instructor, it was great to see you pass and congratulations from all the team at Blue. Learning to drive in the Frome area is a great opportunity as there so many different types of driving conditions and varying road systems to experience that are covered in the Highway Code and the National Driving Standards. The Frome Borough has a population of about 160,000 and this is growing every day, so the road systems are at peak hours very busy and demanding places to drive. The following suburbs and surrounding towns and suburbs such as Frome, Beckington, Keyford, Nunney, Mells, Midsomer Norton, Radstock, Trowbridge, Warminster, Westbury are all populated with a variety of drivers not just in their own vehicles but, tradespeople in their vans, trucks, HGV’s, buses, taxis and let’s not forget cyclists, motorbike riders and the ever present pedestrian, trying to get to work or school.